Caroline Lawrence, author of the best-selling Roman Mysteries series, has combined her detailed knowledge of the Roman period with a considerable storytelling ability to create a gripping new historical adventure. This novel tells the story of 12- year-old Alexander Papas who is recruited by the wildly eccentric billionaire Solomon Daisy to travel back in time to Roman London via a portal accidentally created by the wealthy man’s 'tech guys'. Alex’s task is to find the blue-eyed girl with the ivory knife whose skeleton has been excavated in modern London and with whom Solomon Daisy is obsessed. 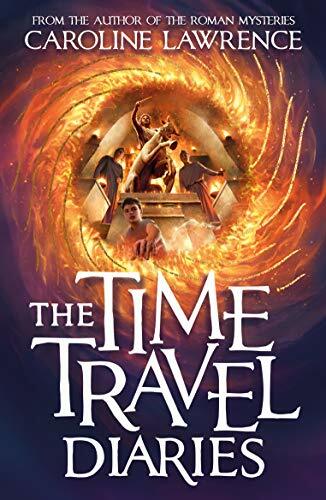 Alex’s knowledge of Latin and Greek make him suited to the role of time traveller and, having been promised a great deal of money, he finds himself hurtling through a portal located in London’s Mithraeum, travelling back 1800 years into the past. Alex has been told the three rules of time travel, 'Naked you go and naked you must return', 'Drink, don’t eat' and 'As little interaction as possible', but these prove hard to follow in Roman Londinium which is confusing, dirty, smelly, unsanitary, unhealthy and much, much more dangerous than Alex ever expected. This novel is full of fast-paced action and the tension increases as Alex makes friends and enemies, finds the beautiful blue-eyed girl and is propelled from one dangerous situation to another. The chapters are short and draw the reader on, the sense of place and time and the links between past and present are brilliantly conveyed, facts are skilfully blended into the story and Alex’s narrative voice is witty and self-aware. Readers are not spared the grisly, brutal realities of life in Roman London with its squalor, disease and violence; young readers will learn a great deal, maybe even some Latin, whilst enjoying a satisfying, humorous adventure story. They may be inspired to visit the actual site of the Mithraeum and find out more about the girl with ivory knife. Caroline Lawrence says that 'our imaginations are the best portals to the past' and she has certainly used her imagination to good effect to bring the world of Roman London vividly to life for present day readers.